“California history is the heart of fourth grade and we wanted to celebrate the day it became a state in 1850!” said teacher Janine De Vera. Walnut – Vejar Elementary fourth graders are becoming map masters while learning about California’s unique coastal beaches, mountains, central valley, and desert regions. To wrap up the recent geography studies, an entire day was devoted to paying tribute to the Golden State on Monday. About 100 students kicked off the morning by making California-shaped cookies and marking each region with colored sugar. “We’re singing songs and making cookies today!” Nathan Chavez shared after creating his confection. “We shaped the dough with our hands,” he added. “And we painted the coastal areas green, the central valley yellow, the mountain areas purple, and the desert region orange” explained Caden Sakai. Then the children dotted the different mountain ranges with chocolate chips. They admitted that a few of the delicious morsels may not have made it onto the cookie dough. “We got to eat a couple!” shared Jaxson Highstreet. “They smell so good!” chimed in Colete Drake as parent volunteers took dozens and dozens of the sweet treats out of the oven. In preparation for California Day, students researched and prepared state landmark projects. They also searched for information about national parks, colleges, museums, and popular vacation destinations. While the cookies baked, students presented their landmark reports in classrooms. They ended California Day by inviting parents to see the projects on display in the multipurpose room at 2 p.m. 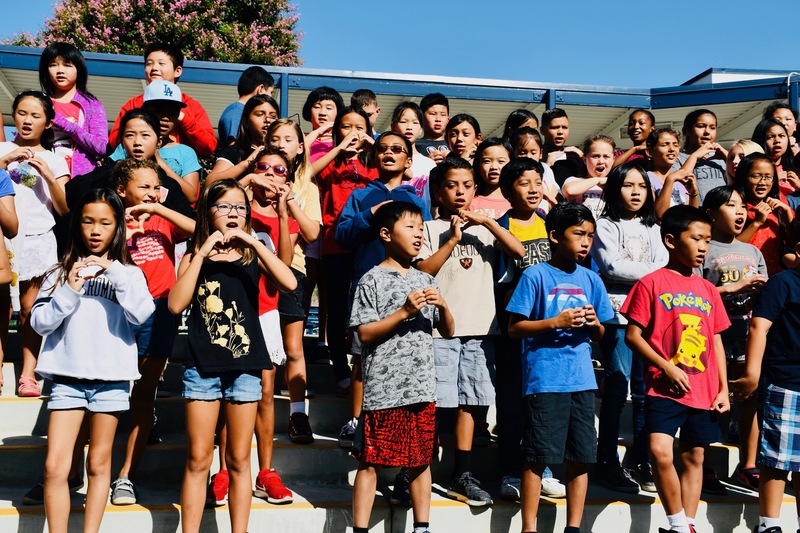 The children performed “I Love You, California”, “Oh California” sung to the tune of “Oh Susanna” the traditional Gold Rush song, “Latitude and Longitude” that helped them learn geography and map skills, and “California Regions” sung to the tune of a popular Katy Perry song. “You can travel the world,” the group sang on the amphitheater stage. And, of course, they gobbled up the freshly-baked cookies!